Last June 15 (if i'm not mistaken about the date), Jollibee launched their new flavored fries - Four Cheese and Sour Cream. My initial reaction was that it was some kind of an idea taken from McDonald's. McDonald's usually has these flavored shaker fries from time to time. The last time they had those was during Kung Fu Panda 2's release. I was vocal about how much I loved the shaker fries ever since and I never really miss out every time they appear on the McDonald's menu. Anyway, going back to Jollibee's flavored fries, I immediately gave both of those fries a try. Surprisingly, both fries were really good! But, Sour Cream is way tastier than Four Cheese I should say. Almost all of my friends know that this is my current addiction. I seriously can't get enough of it. I tweet and post about it all the time. I'm actually over advertising it because it's really that good. It fits my taste well. This was actually a good move by Jollibee. I believe both those fries are a hit judging on the comments I've read and heard. I'm glad this is permanent too unlike McDonald's shaker fries that appear on special occasions only. Again, I'd say it one last time. 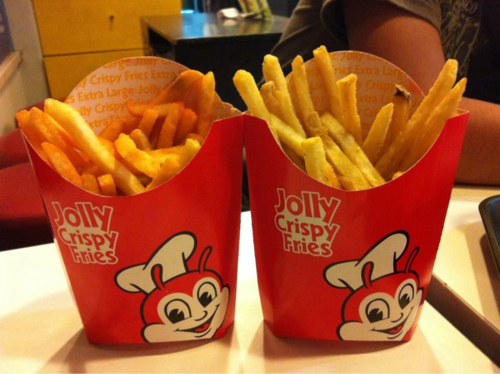 Jollibee's Flavored Fries, particularly the Sour Cream flavor, are a must try. It's quite addictive. 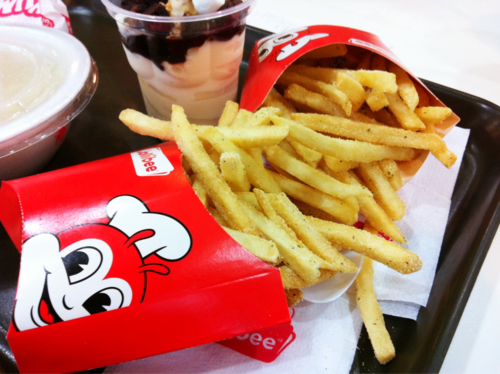 I even find myself in Jollibee fastfood chains now more often than I was in McDonald's just weeks ago.